galloping horse to trigger the shutters of a bank of cameras. He also showed how horse run like never before. 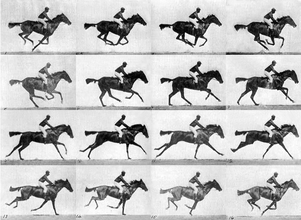 Muybridge invented the zoopraxiscope, showing animated versions of his photographs as short moving sequences, which development the cinema and more ways of creating moving images. The images on the right show a series of photos of a horse moving. Trip wires were used to release the shutters of a bank of cameras along the side of the track. The animated GIF on the right shows what these individual photos look like when played together. For this unit I will be experimenting with a variety of ways to make still images move over the next few weeks. The video on the right is the time lapse I choose it is a variety of sun sets in different places what i like about it is,its clam and everything is not rushy or allover the place, The sunset look amazing also the sound tack to it really combines well and makes the atmosphere to clam and relaxing . I think the the artis of this wonderful time lapse use a professional camera on a tripod : cannon maybe because the images is clear very wide and is in focus also dead still. He/she maybe of used a app or site to edit the separated shots together into a continuos sequence. This is a very different kind of time lapse film created by the artist Sam Taylor-Wood. It has been on display at Tate Modern. The reason why I picked this clip (on the left) is because it has a story to it and it's also very creative, I love the characters that have been drawn it has humour to it; it is different to all of the other stop motion videos I could find. Also I also like how it is done for example: the uses of the hand in the video and just generally how it has been created. The Arties who created this clip may have used stop motion so the animation would be more affective than a flick book or a movie. From looking at this example of a stop animation clip it has really inspired me and show me that you really can do anything with stop motion and make it look amazing also you can go wild with your imagination and the out come would still be amazing. These mini clips of stop motion are the first attempts me and my group done (Me,Nafisa and Alisha). Giftmelter is a website that allows you to take and URL of a animated GIF and melt it. I have done one of the animation on the right to show what it dose.